Mother Nature has out when great thoroughbreds go to the breeding shed, often with disheartening results. But Take Charge Lady is one case where what Mother Nature had to say is absolutely fitting. TAKE CHARGE LADY routs them all at Keeneland to win the Ashland Stakes. Photo and copyright, AP. 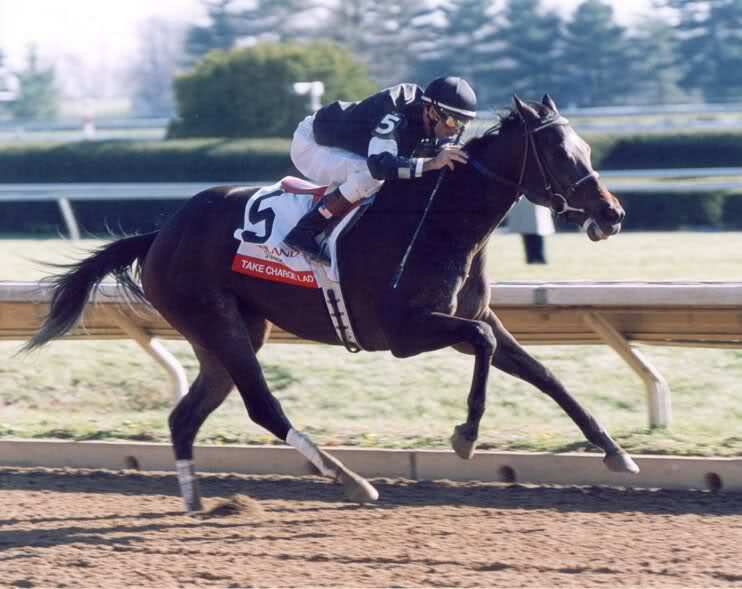 For those of us who remember her on the track, Take Charge Lady (1999) was a valiant and relentless campaigner, taking on the much-adored Azeri (1998), as well as You (1999), Bobby Frankel’s champion, Sightseek (1999), Canadian HOF Dancethruthedawn (1998) and the talented Farda Amiga (1999) in a career that spanned three seasons. 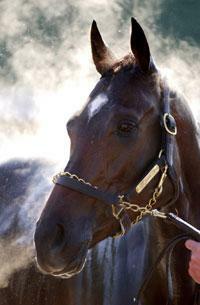 The determination Take Charge Lady showed here in 2002 was characteristic of her. She was what the industry calls an “honest” thoroughbred, meaning that she always did her absolute best, no matter who was at her throat latch. By Dehere (1991) whose BM sire was Secretariat (1970), out of the Rubiano (1987) mare, Felicita (1994), the lean, dark bay filly was destined to be one of her sire’s most outstanding offspring. Trained by Kenny McPeek, who had purchased her for the modest sum of $175,000 USD for Jerry and Faye Bach’s Select Stable, Take Charge Lady took the Alcibiades Stakes as a 2 year-old and then, at 3, won the Silverbulletday, Ashland, Dogwood and Spinster Stakes (which she would win again in 2003), as well as the Fairground Oaks. After the Ashland, McPeek seriously considered running Take Charge Lady against the colts in the Kentucky Derby, opting instead for the Kentucky Oaks. But her front-running ways got the better of her and Farda Amiga (1999) took full advantage of it. Take Charge Lady finished in second place. The loss likely cost her the Eclipse that year in the 3 year-old filly division, which went to the Oaks winner. 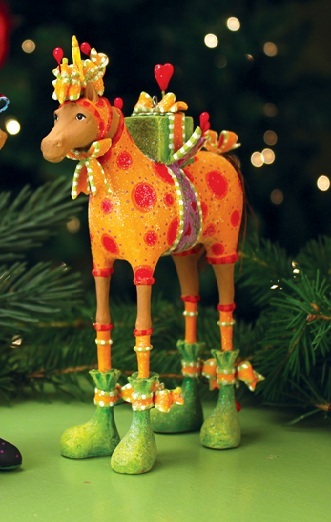 But horses don’t know about Eclipse Awards — they only exist for us two-legged folk. Then came the BC Distaff at Arlington Park, where the brilliant daughter of Dehere was beaten by thirteen lengths. But Take Charge Lady had a good reason for the loss: shortly after the race, she was diagnosed with still another lung infection. TAKE CHARGE LADY ran her heart out as a 3 year-old and racing fans would never forget her for it. She is shown here in the first of two consecutive wins in the Spinster — only the fourth thoroughbred to accomplish this feat. By the time she retired, late in her 4 year-old season, Take Charge Lady was a millionaire twice over. And even though she had been one of those greats that racing fans never forget, her second career has been equally brilliant. 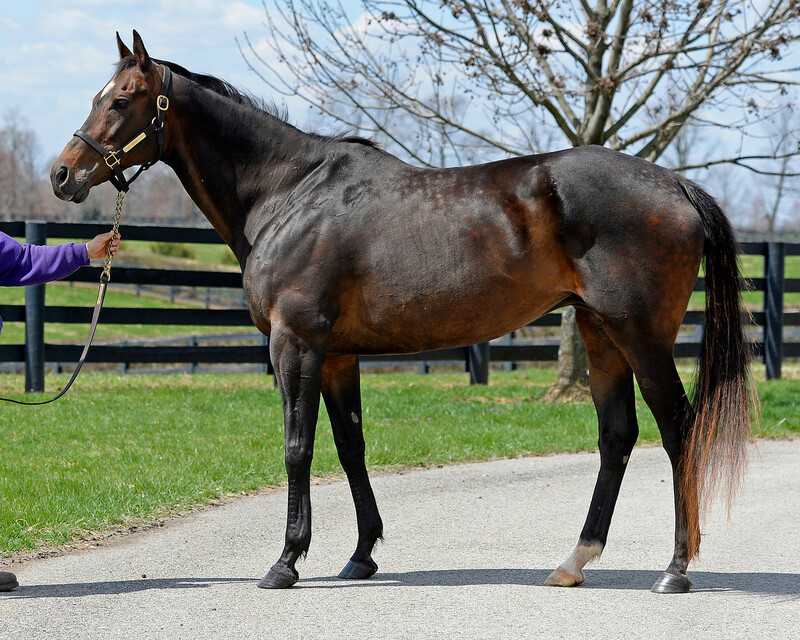 Too, she is still another example of Secretariat’s sire power through his daughters, since her sire, Dehere, is a son of Sister Dot (Secretariat). Of course, the rest of her pedigree is also outstanding, but the intrigue of the Secretariat “big heart” trait is that it does, indeed, seem to be showing up in Take Charge Lady’s sons to date. TAKE CHARGE LADY brought the best of herself to her new career — with stunning results! With a final win in the Starlet Stakes, Take Charge Brandi closed out her juvenile season a millionaire. Take Charge Lady has two other offspring waiting in the wings, an Indian Charlie filly named I’ll Take Charge (2012) and Conquering, her 2013 War Front filly. I’ll Take Charge was purchased by Mandy Pope and Whisper Hill Farm in 2013 and has yet to race. Voted the 2013 Broodmare of the Year, Take Charge Lady is now fifteen and awaiting the arrival of a second War Front foal in 2015. She is dappled and fit and seems to enjoy her second career enormously. Take Charge Lady is remarkable for her stamina, courage and heart, qualities she has passed on to her young. But a Great One — a lady who only knows how to do her very best and does it with class every time — has a way of bringing language to heel. TAKE CHARGE LADY in April 2014 looking dappled and gorgeous. Photo and copyright, Anne Eberhardt for The Blood-Horse. 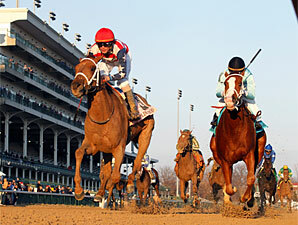 KENTUCKY OAKS & DERBY 2013: IN PRAISE OF LONG SHOTS AND UNDERDOGS! Here at THE VAULT, we’re thinking about the fillies and colts who tend to fly “under the radar” as Oaks and Derby day draw near. After all, our sport would be awfully dull if the favourites always won. Along the trail to the first Saturday in May, thoroughbred experts are busy vetting their instincts and know-how to come up with a likely winner. There are all kind of statistics to pour over: past performances, pedigrees, sire records, profiles of trainers and jockeys. And, when the posts are drawn, there will be debates about the impact of starting positions on performance. Of course, all of this cogitating is what makes horse racing exciting. With the inevitable focus on favourites, it’s easy to forget that every one of the colts or fillies entered in the Oaks or the Derby are there because they’ve earned it. Collectively, these 3 year-olds rank in the top 1% of all thoroughbreds born in the same year. They are athletes trained to perfection, cared for down to the last detail and, more often than not, loved by their handlers, owners and fans. As they parade before the stands on their way to the starting gate, we celebrate their accomplishments and the stories that brought them to Churchill Downs. In those opening moments before the field is set on its way, each filly and colt moves in a shining light of possibility. And, for the true racing fan, that’s what it’s really all about. 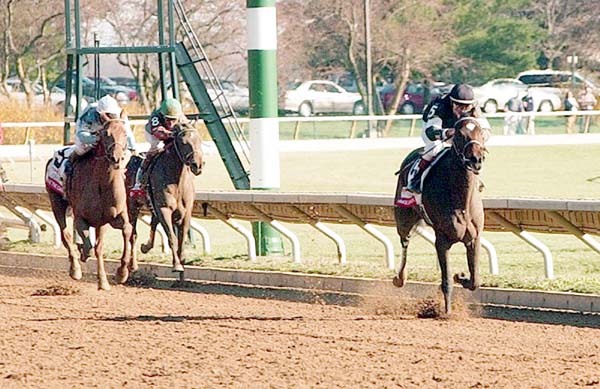 The Kentucky Oaks, inaugurated in 1875, has a no less prestigious history. Marking the start of Derby weekend, it is still seen as a bit of a “light weight” in comparison to the main event. But there are moments when the fillies deliver a champion so moving and so talented, that they manage to dwarf the colts. ……She stepped onto the track at Churchill Downs undefeated and, accordingly, the favourite in that year’s Kentucky Oaks. Her performance on that day was absolutely mind-boggling. Although Rachel Alexandra was neither a long shot nor an underdog, her resounding victory reminded everyone that great horses aren’t the sole domain of breeders like Coolmore, or trainers with enormous stables. The place she won in our hearts on that day stands in memory as definitively as Secretariat’s Belmont, or Zenyatta’s triumph in the 2009 Breeders Cup Classic. Like the Derby, the Oaks has also known its fair share of upsets. The hugest (at 47-1) was Lemons Forever in 2006, who routed the favourite, Balance. But other fillies who flew under the radar until they came across the finish line ahead of the field include: Heavenly Cause (defeating De La Rose, Wayward Lass and the favourite, Truly Bound, in 1981), Seaside Attraction (who beat the undefeated Go For Wand in 1990), Luv Me Luv Me Not (1992), and Farda Amiga (who defeated Take Charge Lady and Habibti in 2002). For all the statistics and analysis, nothing can dull the prospect of that pesky spirit of racing who, every so often, blesses a thoroughbred that was “under the radar.” Here are a few fillies that just might surprise us all. 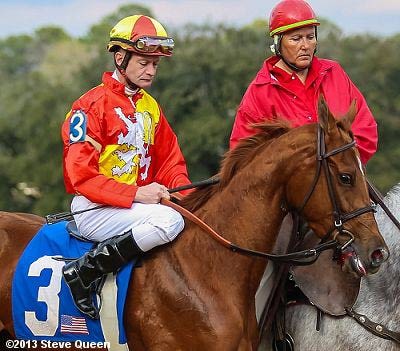 Rose To Gold with jockey Calvin Borel. Photo and copyright, Steve Queen. The chestnut daughter of Friends Lake is not exactly a long shot for the Oaks, having won 5 of 7 starts since her maiden at 2 and carrying second-highest points in the field. However, Rose To Gold comes out of a lesser-known stable and is trained by Sal Santoro, who is hardly a household name. Her sire is useful if not brilliant, having yet to produce a superstar in his 6 foal crops to date. Then again, breeders can be fickle and in an environment where stallions like Smarty Jones get little respect, it’s tough to blame a sire for getting more modest winners. Rose To Gold’s pedigree also boasts the likes of A.P. Indy, together with Kentucky Derby winners Spend A Buck, Seattle Slew and Secretariat on top. Her dam, Saucy (Tabasco Cat ex. Sierra Madre by Mr. Prospector) has produced 6 foals to date, of which Rose To Gold is by far the most distinguished. 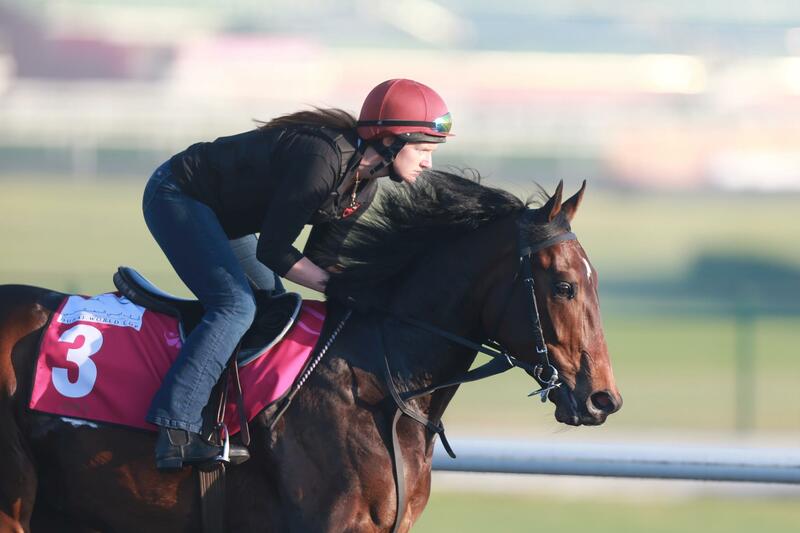 The question about Rose To Gold centres on the fields she’s taken on, or “Who did she beat?” She comes to the Kentucky Oaks out of Grade 3 stakes company, suggesting that stepping up to take on the likes of Dreaming of Julia will require that she’s at her absolute fittest. And it will be the filly’s first start at 1 1/4 miles. However, Rose To Gold has already romped in the slop to win the Fantasy Stakes and assuming that Calvin Borel — her steady jockey to date — gets the nod to ride her in the Oaks, we can count on her getting a very strategic ride. Macho Uno’s elegant daughter, Silsita, has won 2 of her 4 starts and only ever been out of the money once. Her most recent win came in the Bourbonette, which she took in a head bob, although at the finish she looked as though she could easily go further than the mile. And, in prevailing to win the Bourbonette over a very determined Marathonlady, she showed that toughness that we associate with her grandsire, Holy Bull. Although the best she has beaten is Pure Fun, and Flashforward proved too much for her in her second start on January 3, Silsita remains a “work in progress,” improving steadily over her last 2 races. Trained by the accomplished Todd Pletcher, we should assume that Silsita’s entry in the Oaks speaks loud about what he thinks of this filly. Silsita’s dam, a daughter of the great producer, Wild Again, made 33 starts, retiring with a record of 6-9-6 and earnings of $293,134 USD. The filly is Naturally Wild’s third foal to date and all have been modestly successful. 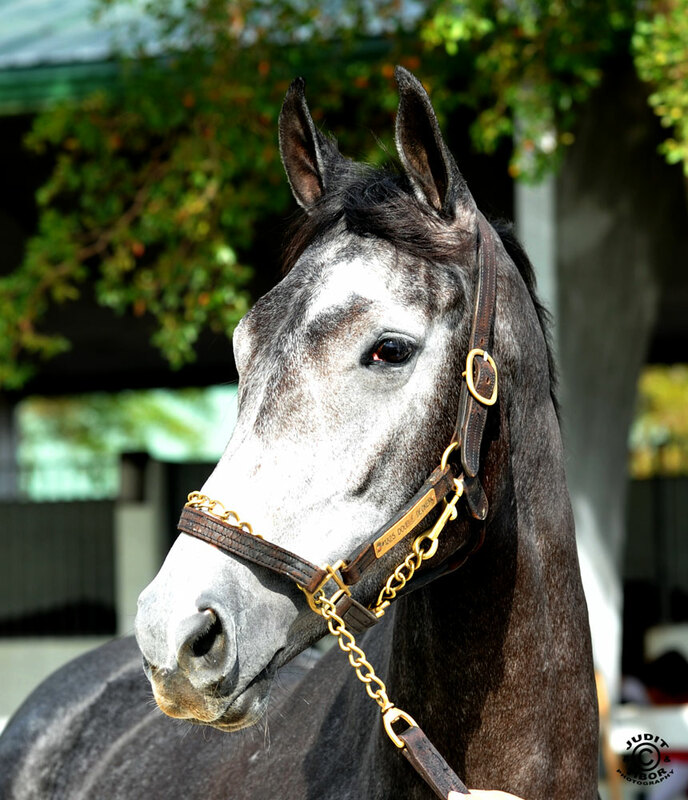 Holy Bull’s granddaughter may be poised to make the finest effort of her career on May 3. Spring At Last hails from the sire line of Deputy Minister and his dam, Winter’s Gone, is 4 X 3 to both Ribot and Flower Bowl, through the spectacular brothers His Majesty and Graustark. Racing at 2, Seaneen Girl finished her juvenile season with a win at Churchill Downs in the Golden Rod Stakes. Seaneen Girl winning the Golden Rod at Churchill Downs in November 2012. Having made 7 starts in her career, winning 2 and finishing in the money another 3 times, this filly is honest and has performed consistently as a 3 year-old. She may have been beaten previously by Flashy Gray and Unlimited Budget, but Seaneen Girl has a very canny trainer in Bernie Flint, who has chalked up a sizeable number of winners and been the leading training at several different race tracks, including Churchill Downs. Even though Seaneen Girl is stepping up in class to take on some serious talent, there is no doubt that she will try her best to run them down. The fractions in her last 2 races compare nicely against the recent performances of favourites like I Dream Of Julia.With a pedigree that includes names like Dynaformer, Waquoit, Graustark (4 X4), Roberto, Princequillo and Secretariat, Seaneen Girl has enough blue blood to do battle with the very best. Make no mistake about it: Lines of Battle is a very fine specimen who, if he shows up for the Derby, arrives at Churchill Downs with the second-highest earnings in the field. His last race was a win in the UAE Derby (above) and he carries a decidedly American — and deep — pedigree. War Front is proving a very good sire and the colt’s dam, Black Speck, is a half-sister to Dynaformer and she has already produced other black-type winners. The magnificent Lines of Battle at work prior to winning the UAE Derby. The key factor mitigating against his being a resounding Derby favourite is that it remains unclear whether or not his connections have been able to de-code the requirements to win the Kentucky Derby. Aidan O’Brien has certainly been knocking at the Derby door, and no-one would contest his brilliance. However, Coolmore’s Derby entrants consistently arrive close to Derby day and this means their colts have had little time to acclimatize to the change of scene and the deep Churchill track. Lines of Battle will find himself in the same situation as previous Coolmore entrants, although he does have a dirt pedigree, something that many of the other O’Brien trainees have lacked. The impeccably bred son of War Front will get 2 works over the track prior to the Derby, but it should be noted that several of the hottest contenders have been at Churchill for several weeks. In terms of running style, Lines of Battle tends to be a closer and, in a race where stalkers and closers have the decided advantage, he may indeed give Coolmore and Aidan O’Brien a much-covetted crown. Although there are stamina questions about the mile and 1/4 being the best fit for this colt, it’s impossible not to love the honest Itsmyluckyday. He’s got all the bling that made us love his daddy, Lawyer Ron. He’s also chalked up a lot of running experience under trainer Eddie Plesa Jr’s tutelage: Itsmyluckyday makes his 11th start on the first Saturday in May. Itsmyluckyday pictured after his second place finish to Orb in the Florida Derby. 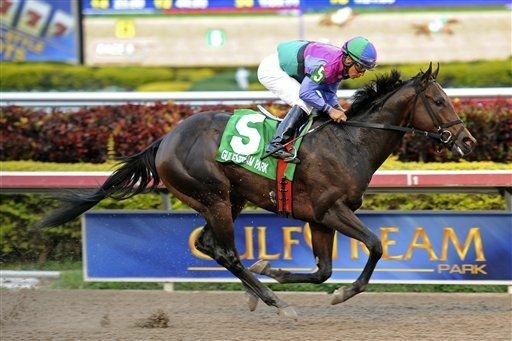 In the Florida Derby, the colt was well-beaten by Orb, but he also chalked up a second defeat of Shanghai Bobby and Frac Daddy in as many starts. Itsmyluckyday always gives 100% +. And he’s a stalker, another advantage in a Derby where there are no speed horses. 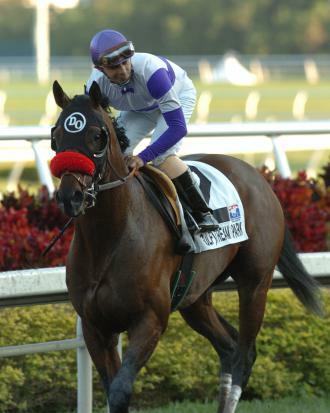 But this colt has speed when he needs it: he ran the Gulfstream Park Derby in 1:09 flat in his first start of 2013 (below). In a word, Itsmyluckyday was brilliant in that race, although the competition was not up to the standards of his subsequent Holy Bull win. But this determined colt is coming along very nicely and he may just do his daddy proud come Derby day! Aside from the important fact that this colt has done everything right coming up to the Derby, his dam was a superstar who had the kind of heart that makes falling in love with thoroughbreds easy. Will Take Charge is her second offspring, after Take Charge Indy, to show his mettle on the track. And last, but hardly least, Will Take Charge is trained by HOF trainer, D. Wayne Lukas. Need we say more? 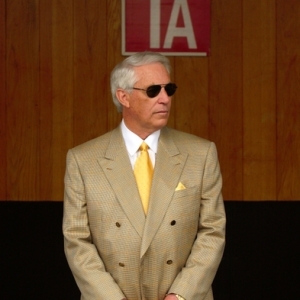 The legendary D. Wayne Lukas is tied for most Triple Crown victories with the late, incomparable Sunny Jim Fitzsimmons.